That will be a really AMAZING conference and we had several news for you and for all the attendees. The previous conference was sold out in 40 minutes for 170 available seats, but now we have more seats so everything should go in the right way for all of you but, if you want to be the first to know about the conference, and to have the possibility to pre-register before the official registration opens, go to our website http://webnextconf.eu/ and subscribe to the mailing list. First July the registration will be free for all but, few hours early, we'll send the registration link to all people who subscribe our newsletter. As for the previous edition, the conference will be free. That's really important and it's the difficult part of the organization. Is not easy to find the money for speakers, rooms, other stuff and keep the tickets free, for this reason your support is more important than ever. During the registration you can choose if you wanna come for free, if you want the lunch (around 10€), the T-Shirt (€10) and if you want to make a donation (as you wish). We'll use the donation for the organization, speakers, stickers and other stuff like that. The conference will be in Milan, University of Milano-Bicocca so, if you think you wanna come, it's time to book your hotel. That's important because there is the Expo fair in Milan, so lot of hotels are fully booked, don't wait! 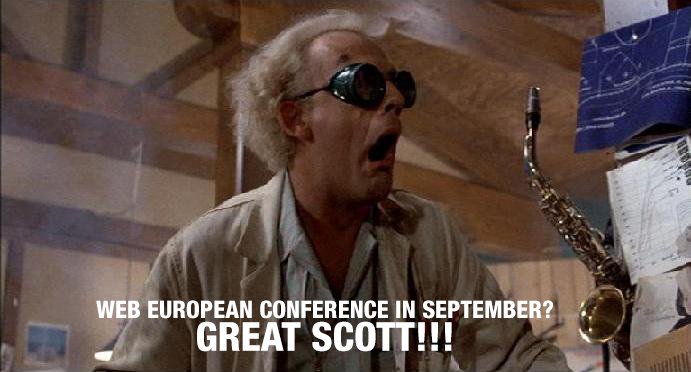 Finally, I'm very happy to announce two important speakers that will be here in Milan The Great Scott Hanselman and the fabulous Dino Esposito who will talk about ASP.NET vNext and "Extending RWD with Lightweight Client-side Device Detection". So far we received almost 50 proposals from 20+ different speakers, but to get even more speeches to choose from, we've decided to keep the call for presenters open till the end of June: if you haven't done it yet and you want have the chance to be in the "speakers room" with Scott, go on our Github account, fork the c4p repository, add your proposal and submit a pull request. Is that cool enough? Yeah! But the surprices are not over, other cool speakers could come, so stay tuned.